We Are The People The State Doesn’t Want You To Know About! LOUISIANA CONTRACTORS LICENSING SERVICE INC. In the past 26 years we have served over 35,000 successful contractors. 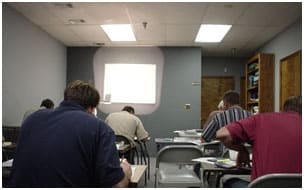 Louisiana Contractors Licensing Service has been offering contractor licensing exam preparation classes for over 19 years. With a bachelor’s degree in building construction and 30 years of experience in the contracting industry, Ron Squyres has both the educational and technical background to prepare students for careers as state licensed contractors. Louisiana Contractors Licensing Service aids students with state licensing exam preparation, utilizing practice tests, classroom instruction and custom designed preparation software. Louisiana Contractors Licensing Service has helped over 35,000 successful contractors pass the state licensing exam. The preparation classes that are offered have proven to be very successful; 98% of the students pass the state licensing exam the first time they take it. Call us today and become one of our successful students, it’s the easy way to pass the state licensing exam the first time. Staff members are here to help with any and all technical and math questions that students may have. This is our only business, not a sideline. We are so confident in our program, we offer a money back guarantee – in class only – (call for details). Our office is conveniently located off I-12, just a few minutes drive from the test location. Please feel free to call us for directions or area hotels. Removal, Repair, and Maintenance for Buildings and Premises. not listed in which he is presently performing).